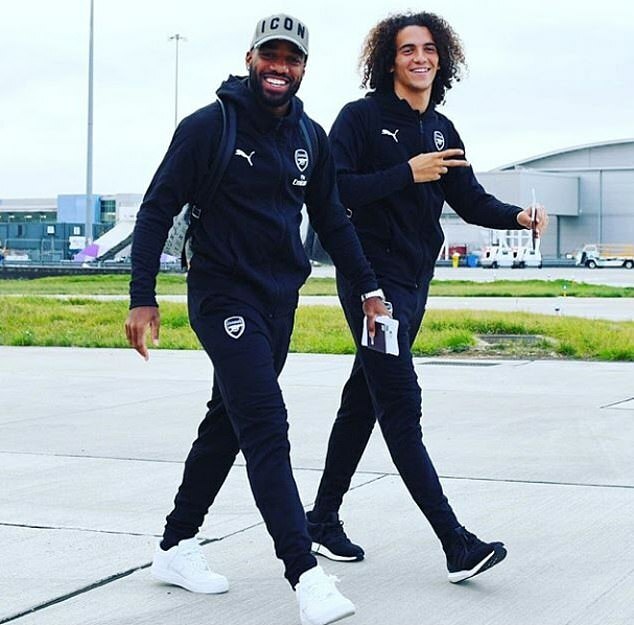 Arsenal stars appeared to be in buoyant moods as they jetted out to Lisbon ahead of Europa League clash against Sporting with the club closing in on their record number of wins in a row. Unai Emery’s men will go in search of their 11th win on the bounce when they face Portugal giants Sporting on Thursday evening, which is only three away from their all-time record that came all the way back in 1987. 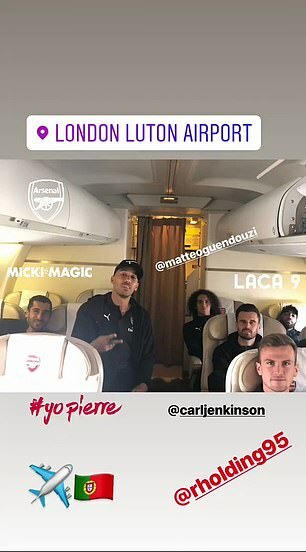 The Arsenal squad departed London on Wednesday and are due to touch down in the Portuguese capital later this afternoon. 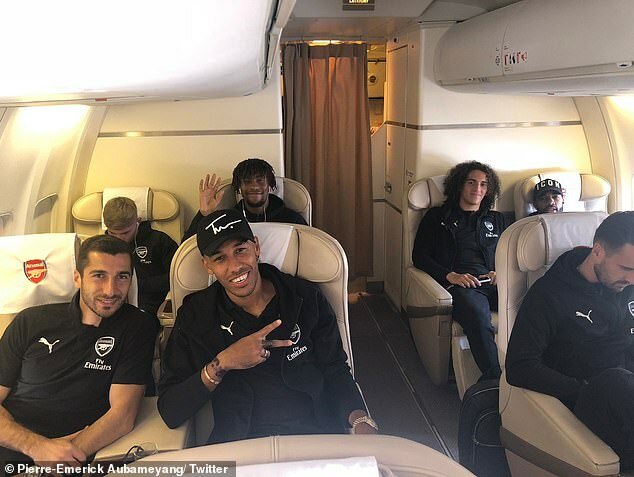 Pierre-Emerick Aubameyang, who has played a significant role in Arsenal’s winning run with four goals from his last two games, took to social media to post a picture of him with several of his team-mates sat in their seats during the flight. 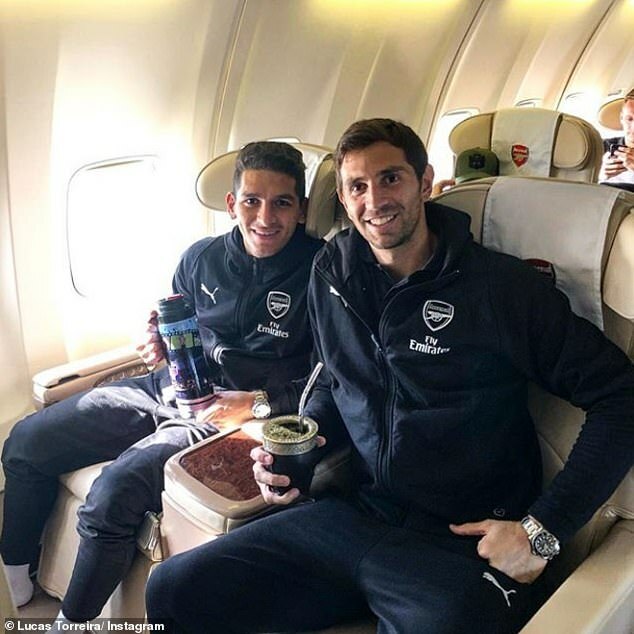 Lucas Torreira also shared a snap of him and Emiliano Martinez on Instagram drinking mate tea out of a gourd during their flight to Lisbon. After losing their opening two games of the season, Emery has overseen a complete turnaround in fortunes with his in-form Gunners side now just a handful of games away from breaking a club record. They will also be boosted by the return of Sokratis Papastathopoulos, who has travelled with the squad after missing their last game due to an ankle injury. A victory on Thursday for Arsenal would bring them one step closer to that record of 14 straight wins and would also see them take control of Group E.
Arsenal and Sporting have both taken maximum points from their opening two games and can take a giant leap to securing a place in the knockout rounds and to qualifying in top spot with three points on Thursday.